Born on February 24, 1974, Rubens Mariano’s first contact with music was at the age of 12 when he received his first musical instrument from his Father. After this, music became a permanent part of his life. In 1996 when he left the FAB (Brazilian Air Forces), he entered the ULM (Free University of Music) where he studied Popular Music on saxophone during four years. There, his instructors were Hudson Nogueira, Mane Silveira and Vinicius Dorin. He also had the opportunity to study with Vitor Alcântara and Rodrigo Bento and Claudio Leal. Influenced by Smooth Jazz, Funk, Soul and Jazz, his influences include great saxophonists like Kirk Walum, Dave Koz, Gerald Albright, Erick Marienthal, Michael Brecker and also Brazilian Saxophonists Zé Canuto and Marcelo Martins. Over the years, he has made several major commercial Recordings and performed thousands of shows in Sâo Paulo and around all of Brazil. In 2012 he became an Endorser of P Mauriat Tenor Saxophones. In 2013 he released his first Saxophone Solo CD – “Soul Mate”. In 2014 he became an Endorser of Jansensax Alto Saxophones, JodyJazz Mouthpieces and Francois Louis Ligatures. 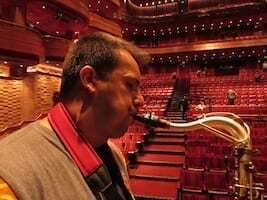 Also, he started a saxophone partnership with Diogo Pinheiro and created the Duo Sax. He is an active freelancer playing all kinds of events, shows and recordings and also performs regularly in Duo Sax with Diogo Pinheiro. His Youtube video of ‘A thousand Years” has over 248,000 views.